Was Crown Princess Victoria the only foreign Royal to attend? Yes, it seems so, if you don't count the widow and daughter of prince Carl Bernadotte (princess Ragnhild's maternal uncle) as royals. I'm rather surprised that there was no one from Belgium (and also Luxembourg). Ragnhild and Albert were first cousins after all. why did victoria sit in the front row? a video VGTV The end is very touching, when they all leave. It's nice that Crown Princess Victoria and the widow and daughter of prince Carl Bernadotte (thanks for identifying!) were present as well. The picture of CP Victoria together with Erling Lorentzen is so touching. "It is a strange feeling to lose your mother"
I'd say because she was there representing her father. Carl Gustaf would have been seated in front row. Thanks I hadn't noticed Carl Bernadotte's daughter but I'll have another look! According to Se og Hør Victoria arrived earlier today with princess Kristine Bernadotte. Very interesting pictures. Thank you for providing links. Princess Victoria so kind to hold the arm of Erling Lorentzen. This must be the chapel where Princess Ragnhild was baptized as a child. Very odd that no representatives from either the Belgium or Luxembourg royal famillies attended considering the blood-relationshp. Perhaps someone could comment on whether or not there is a "close" relationship -- perhaps the fact the Queen Astrid died at such a young age and Leopold remarried had something to do with it? I would guess that it has more to do with the fact that princess Ragnhild have lived in Brazil since the mid-1950ies, and haven't had much contact with the Belgian and Luxembourg royal families after that. The only one who have any connection with Ragnhild would be king Albert, but it would be unlikely that he would have gone to a private funeral. I doubt that the younger members (Henri, Philippe and their siblings) have met Ragnhild more than a few times. I remember reading somewhere that both the Belgian and Norwegian royal children spent summer holidays with their grandparents in Sweden, but World War II put an end on those visits. these days..He appears as old as Queen Elizabeth II...Hope he is in good health and lives longer.. I would like to see a picture of her youngest child, who was born some time after the others. Just think, in today's royal world, she would be presently mourned as queen, and a different Haakon would be Crown Prince. But would she have missed the faithful Erling Lorentzen, then? No, in today's world, he would be Prince Erling (I guess), and a fine looking prince like Prince Daniel. 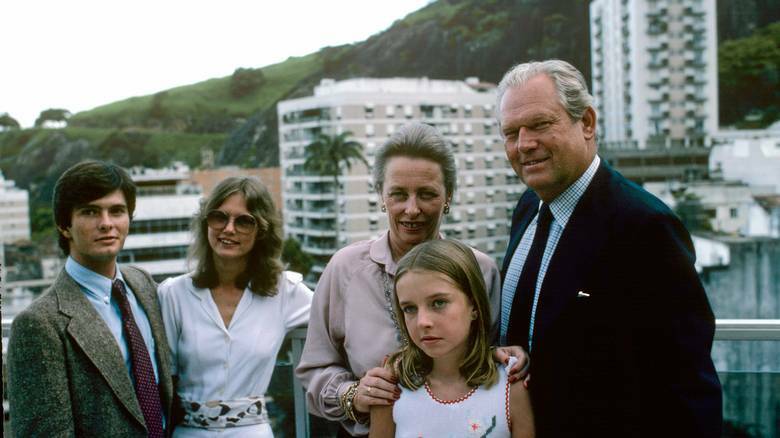 Here is a picture of the family in Rio 1980 - daughter Ingeborg Lorentzen and her husband Paulo Ribeiro, Princess Ragnhild, Erling Lorentzen, and in the front the youngest child Ragnhild Alexandra (she was 12 years old then). the younger generation have busy schedules and the regal couple are abroad. It was a very small and private funeral and I think only those that they asked were present. As to being busy . . . sadly one is never too busy to attend a funeral.